Perched very high in the Peruvian Andes, parts of the largest tropical ice cap melted world at an incredible pace. Scientists have found that significant portions of the ice sheet Quelccaya which took over 1,600 years to form melted in just 25 years. 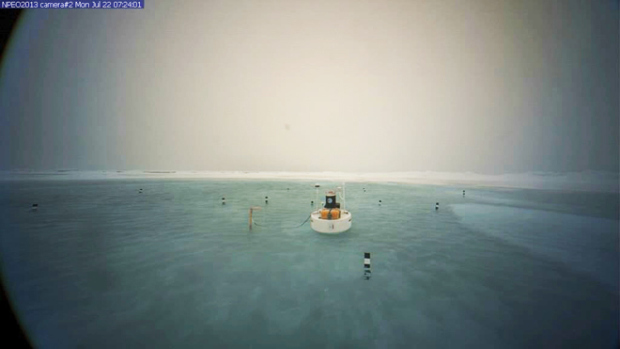 Meanwhile, at the other end of the globe, instead of snow and ice swirling in the wind as we could see, there is only one year, a lake of slush (in Quebec, this is called the slush), one to two feet deep now sloshing around a webcam stationed at the North Pole. The lake melting began to form on July 13, 2013 after two weeks of warm weather in the high Arctic. In early July, temperatures were 2 to 5 degrees above average over much of the Arctic Ocean Fahrenheit, according to the Snow & Ice (National Data Centre). The meltwater ponds germinate more readily in recent years, covering the thin ice, which now accounts for more than half of the Arctic sea ice. The lakes and ponds escape on the smooth surface of the arctic ice, promoting the creation of a network that traps the sun’s heat. We are witnessing the gradual disappearance of certain multi-year ice thick and wrinkled, who survived more than one freeze-thaw season, because of its rough and irregular surface. July is the month of melting and warmer temperatures in the Arctic, where the ice is rapidly shrinking. An Arctic cyclone, which can compete with a hurricane of great strength, is scheduled for this week, which will help to break the ice and the level of circulation of hot water from the ocean, accelerating the summer melt. The Arctic has reached record levels of melting the ice was last year on 16 September 2012, the smallest area of ​​Arctic sea ice recorded since satellites began monitoring the Arctic ice in the 1970s. The rapid and relentless melting of the Arctic is an « economic time bomb » that could cost the capitalist world, at least $ 60 trillion, say researchers who have begun to calculate the financial consequences of one of the fastest changing climates the world … in all its history. A record decline of Arctic sea ice has been widely regarded as economically beneficial so far by Wall Street economists (the balance of the New World Order), because it opens up more opportunities for expeditions and drilling in an area assumed to contain 30 percent of natural gas deposits in the world undiscovered and 13 percent of its undiscovered oil. However, the central role of the Arctic in the regulation of ocean and climate means that it is likely to cause climate change that could damage crops, flooding properties and infrastructure of the wreck in the world , according to a study by academics at Britain’s University of Cambridge and Erasmus University Rotterdam in the Netherlands. This is likely to lead to the creation of new costs that exceed the benefits of three or more orders of magnitude of the potential benefits, said Chris Hope of Cambridge Judge Business School. « People calculate the potential economic benefits in the billions of dollars we are talking about potential costs due to damage and the additional impact of the order of tens of billions of dollars, » he said. Arctic warms two times faster than the rest of the world for many years and the area of ​​the ice that melts and re after every summer, was reduced by an amount almost equal to the size of the United Kingdom every year since 2001. Last year, the summer ice has been reduced to its lowest point since satellite observations began in 1979, raising concerns about the impact on the climate. European researchers have focused on how the warmer waters in the Arctic should accelerate the thawing of permafrost under the East Siberian Sea north of Russia, which is supposed to contain large deposits of methane. It is a greenhouse gas 20 times more potent than carbon dioxide, even if it does not last as long in the atmosphere. There is much debate about how long it might take to release those methane deposits, and the impact it would eventually have. But some scientists say there is already evidence of large plumes of methane escaping and others fear that this might happen quickly enough to accelerate global warming and ultimately accelerate other changes such as the melting of the ice cap ice of Greenland, which contains enough frozen water to raise sea levels by 7 meters. This is why the group felt it was important to assess the potential economic impact of these changes, said Peter Wadhams, professor of ocean physics at Cambridge who believes that the sea ice in the Arctic could completely disappear in summer by 2015. Earthquakes contribute to global warming by releasing greenhouse gas emissions very powerful, including methane from the depths of the ocean. A study by Swiss and German scientists discovered a natural source of greenhouse gas emissions. The researchers stress that climatologists need to consider the amount of methane that is released by earthquakes fracturing seafloor leave open leaks. To better understand the various sources of GHG emissions: researchers at the University of Bremen have discovered a submarine earthquake in Pakistan, 70 years ago tore leaving open the sea bed and releasing the greenhouse gas emissions, « methane » in the atmosphere. « We suggest that this new source could be considered in the future, » David Fischer, a postdoctoral researcher at the University of Bremen, Germany, and lead author of the study, quoted in the New York Times. Researchers who analyzed sediment cores, met in 2007 at two locations in the northern Arabian Sea. Referred to as the Makran subduction zone, the boundary of the plate triggered tremors most terrible land and murderers like happened in 1945 in Pakistan. A 8.0-magnitude earthquake in Pakistan has resulted in a tsunami causing around 4,000 deaths, according to reports LiveScience. It is well known that the floor of the sea are ideal for the formation of methane in the deep ocean and seabed. Methane hydrates are stable in cold and low temperatures and excessive pressure. The pressure below the water depth of 350 meters helps stabilize hydrates. For this study, researchers analyzed sediments taken from where the cores have revealed the presence of large quantities of methane. The calculation of the rate of methane in carrots, they felt that there was a significant increase in the level of gas from the earthquake of 1945. The researchers calculated that over the past decade, nearly 7.4 million cubic meters of methane escaped to the surface. « Based on several indicators, we postulated that the earthquake has led to a fracturing of the sediment, releasing gas that has been trapped below the hydrates in the ocean, » said Fischer. So slowly but surely, we easily will exceed the point of no return and become poisoned our atmosphere, killing most of all life forms on Terre.Les NWO leaders are aware of this death and even try to ‘entretenir.D Moreover, the Bill Gates of this world have already jumped the gun and have built shelters for survival, including all the comforts for a long time. We, the people of Earth Humans, are doomed to remain asleep and away from these information for Elite. To allow him to prepare for the worst scenario that prepares around us. If we fight for the New Era, if we struggle to abolish it, and look for a natural alternative to the New World Order, we will prevent the continuation of the Sixth Great Extinction of Species Massive leaving a New Paradise in the Heritage Future Generations. Vote for life with our heart!